PHOTO: Allen Ramsey, DWCPhoto.com. 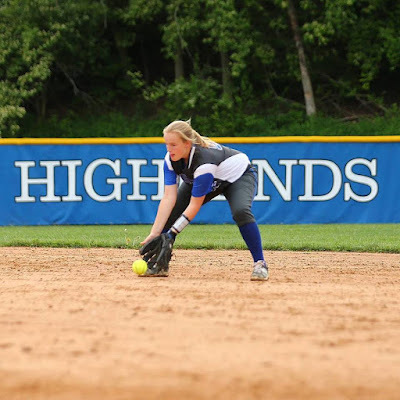 Highlands freshman Rachel Gabbard fields a ground ball in a recent game. The Highlands Ladybirds softball team entered the season knowing it would be tested. Highlands took on three teams that had won at least one state championship since the fastpitch tournament started in 1995. The Ladybirds went 2-1 against those teams beating Ryle and Greenwood but lost to Allen County-Scottsville. Highlands stated the season 1-4 but has reeled off 10 straight wins to move to 16-6 on the season. Senior pitcher Bailey Spencer has been excellent lately. Highlands has shut out its last five opponents to improve to 10-0 in 9th Region action. The main question mark for Highlands entering the season came at third base. But freshman Zoie Barth filled that role quickly. Other players like freshmen Rachel Gabbard, Morgan Coffey, Chloe Jansen, sophomore Josie Daley and junior Taylor Baioni have had their moments. The Ladybirds won the 9th Region last year to make their first-ever appearance at the state tournament. Notre Dame upset them in the title game last year. But Highlands has won two straight 36th District titles. The Bluebirds (13-12) have had their up and down moments this season just a year removed from a state runner-up finish. They also played a tough schedule and ventured out to western Kentucky to face teams in the 2nd Region. Highlands beat an Ohio team for the first time this season Tuesday with an 11-4 victory over Cincinnati Elder. Highlands is hitting .318 (200-of-773) as a team with 26 doubles, six triples and three home runs. Junior Trey Bowden leads the Bluebirds with three triples while four have a team-high three doubles. Junior Kyle Finfrock leads players with at least 40 at-bats with a .439 clip going 18-for-41 with three triples and a home run. The Highlands pitching staff has a 3.62 earned-run average. Senior Ricky Raisor (3-3) leads Highlands with 54 strikeouts. "Everyone, including the coaches, are starting to better understand their roles," said Jeremy Baioni, Highlands Head Coach. "More importantly, we are starting to accept those roles. We are really buying into the team concept and are doing everything we can to help the team win. We still have a lot of extremely challenging games left on the schedule and two big district seed games. We are looking to play well and build momentum into the postseason." The Bluebirds travel to Morscher Field in Silver Grove on Friday to take on Newport Central Catholic. Game time is 5 p.m. Both Highlands teams are having great seasons. The Ladybirds are undefeated and the Bluebirds are 14-3. They travel to Cythiana this weekend attempting to defend their 10th Region titles. The Bluebirds won the Class AA title two years ago and came a point of repeating last year. They hope to win it again despite the loss of senior distance runner Ethan Shuley. Seniors Geoffrey Mearns, Matt Gray and Nick Kendall have picked up the slack along with junior Jared Pulsfort. Senior Tyler Robinson has given Highlands points in the shot put. His longest so far has been 49 feet. The Ladybirds have had a lot of meets cancelled because of the weather. But they still hope to finish in the top three at state. The other state contenders are Paducah Tilghman, North Oldham and Lexington Catholic. Senior Mikayla Reichert leads Highlands. She finished in the top five at the 2A state meet last year in the shot put and discus.